We awoke to overcast skies this morning and were fortunate to hike the first half of the day without the sun beating down on us. We got started by 6:30am and the morning started with a leisurely road walk. I was excited because until the sun came out around noon, I was able to wear my t-shirt and shorts without worrying about burning. We had a couple options for water. So far, all our water has come from a Sam Hughes water cache. If they didn’t exist, we’d have to filter and great water from cow infested mud ponds or water tanks. The last cache we were at was very low on water, so we weren’t sure if there would be much for the four of us at the next one. 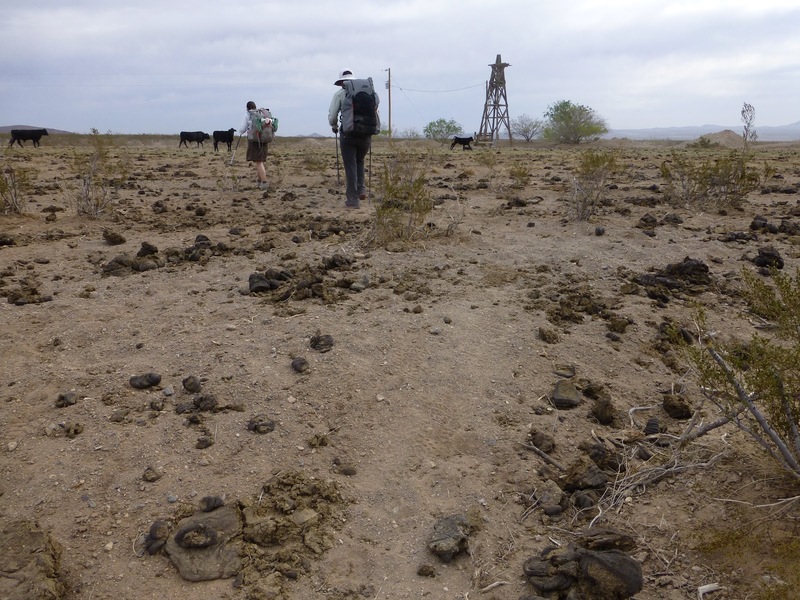 Before we got to the cache, we got to this horrible mud pond surrounded by cows and cow poop. Many water sources on the CDT are like this. The girls all grabbed water from the pond just in case the cache was empty. Sam amazingly remembered to find my brush at his house and returned it just as he said he would. I was shocked with all he has to do that he remembered! He is quite the trail angel! Also, Sam’s friend Steven who picked us up in the yellow van from the train station left Liz a little birthday gift. A beautiful poem he had written! He was an English professor at one time and it was very sweet of him to think of Liz and leave her that gift. 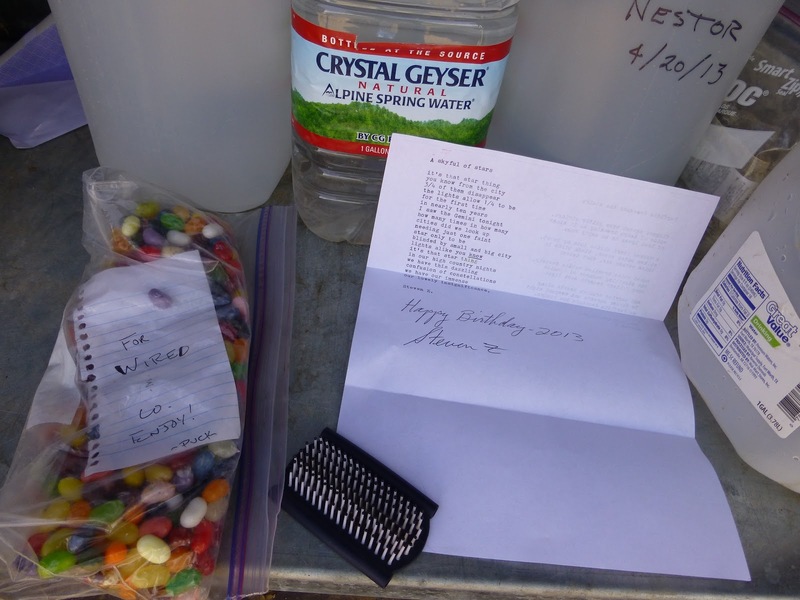 The third thing in the cache was a big bag of Jelly Bellys! 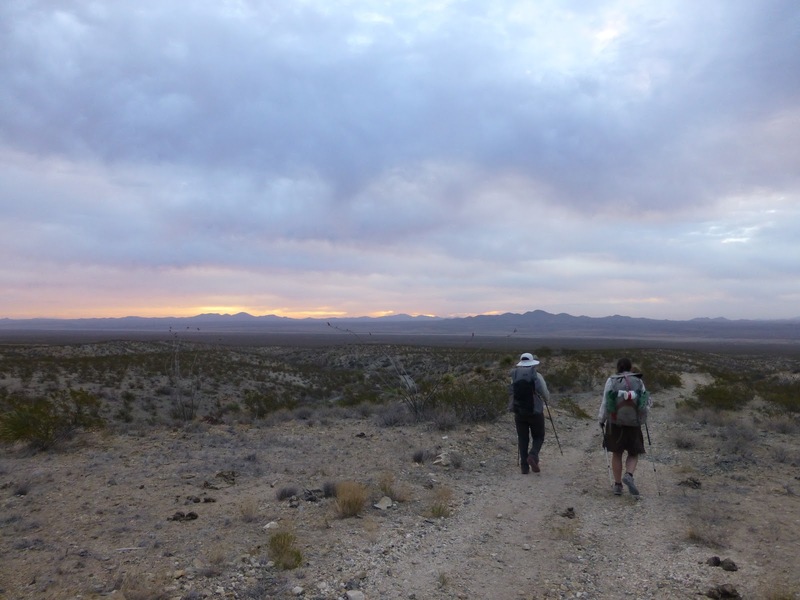 It was from Puck, the hiker ahead of us by a day we met the first day as Sam drove us to the border. Before the hike, a month or so ago, I helped Puck get the CDT waypoints on his GPS. He wanted to thank me, so there were Snickers for me at Sam’s the first night and now these Jelly Bellys. We ate a lot of the bag and left it as a treat for the hikers behind us. Our “lunch” was quick at just about an hour because the overcast has dissipated and the sun and heat was reaching its peak. We had done 12mi and knew the next cache was 13 more miles away. 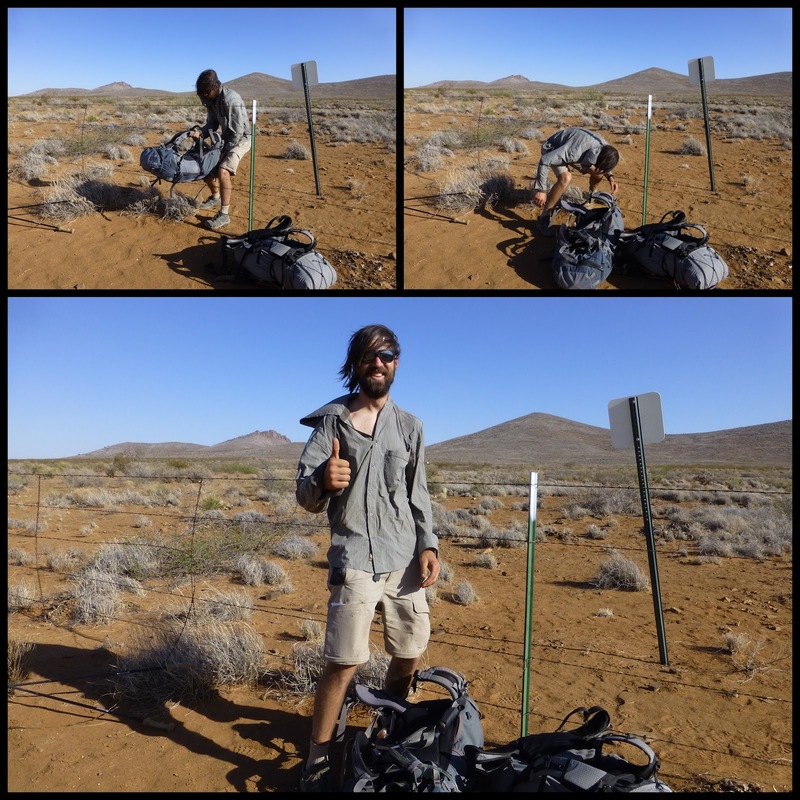 Doing 25mi on our third day was not ideal, but unless we wanted to carry a ton of water and dry camp(camp without water) we needed to push. No long break today. The sun came on strong and luckily, so did the wind. It was mid 80s, but feels much more intense when you’re tired, carrying a heavy pack, and know you have 13 more miles to go. We had a lot of different terrain. The wind kicked into high gusts and we had road walking combined with more of that cross country with the big CDT blazes and light treated footpaths. 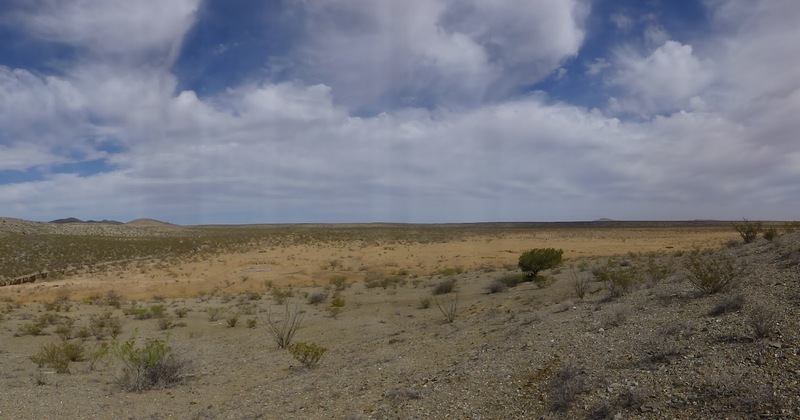 I know the camera stitch is off a bit, but this is a good visual of the barren land we’re hiking across. Look closely in the center and you’ll see the CDT sign. 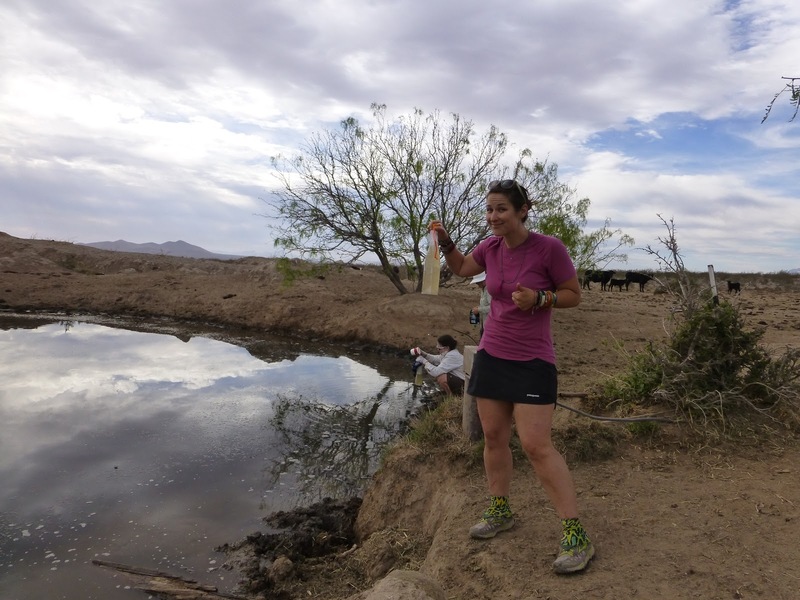 The cross country varied from deep and sandy with brush, to lightly dusty, to lots of rocks and little boulders. 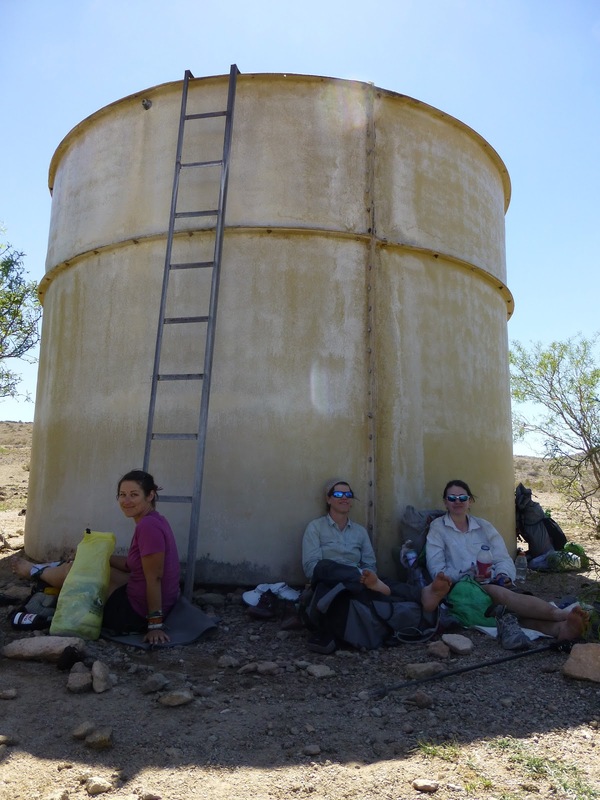 Around 2:15pm, the rest of the group wanted to take a break in the shade at a water tank. It was the only piece of shade other than a tree next to it we saw all day. All of us are having some combination of aches, blisters, heat rashes, chafing, and soreness. Just the adjustment to the hiking world again, but for me, stopping makes it worse. I sat there for about 45mins and popped a couple blisters and did some blogging. 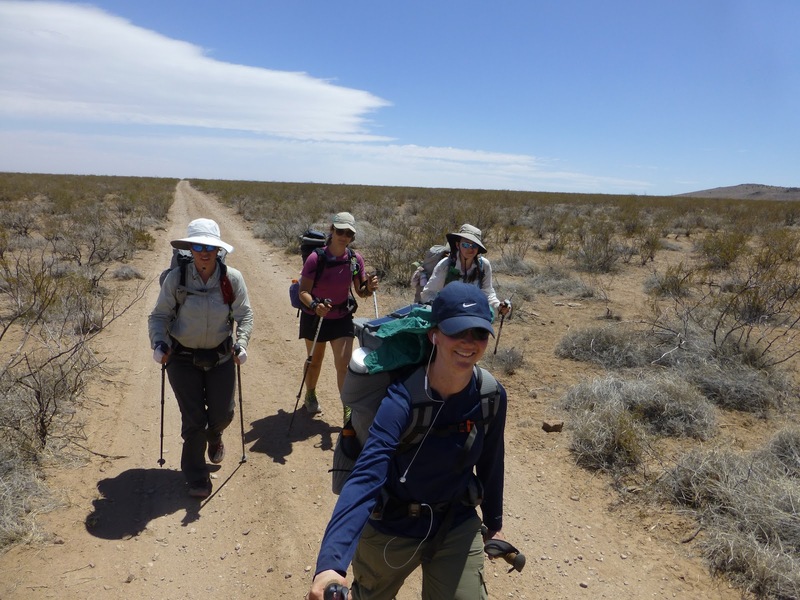 There was 8mi left, so I chose to go on ahead and meet the girls where we planned to camp at the cache. My body just doesn’t do as well if I keep taking breaks. I enjoyed doing those miles on my own. It was fun to figure it out on my own for a bit. I feel like I’m getting the hang of the cross country and finding the signs along the horizon or hidden among the far off brush. I saw Strider in the distance and lost him somehow when I crested a hill and he just vanished. About and hour or more before the cache, I hiked near some power lines and tried my phone. My first Internet of the trip! I was happy to get my posts up from the last few days. While I was doing that, Strider walked up. Turns out, he stopped when he saw some interesting rocks and I somehow hiked right passed him. We hiked the remaining few miles to the cache together and he is camped with us tonight. We are all on about the same schedule, so we’ll probably continue to see Strider up trail. Here he is showing the first barbed wire fence we had to go through. This will happen often due to all the cows and fences. It was super windy, so we all waited until the sun went down before pitching our tent because the wind seems to die down after the sun sets. It is totally calm now, but it was so windy that most of the group cooked in the bear box as it provided a great wind shield. I just want to point out to anyone who thinks thru hiking is lounging in the shade and eating all day, today was a 12hr day of hiking with only two one hour breaks. Those of us out here do it cause we love it. I’m happy I’m able to share it with all of you!